Craniosacral therapy (CST) is a light-touch manual therapy that addresses restrictions in the body and improves the flow of health. CST reduces accumulated stress and promotes a sense of well-being. CST is performed on a person fully clothed, lying comfortably on a massage table. The therapist places her hands at different points on the body including the legs, tailbone, spine, rib cage and head to facilitate a release. Craniosacral therapy works with the bones, soft tissue, fluids, and energy fields of the body. Children and adults of all ages can benefit from CST. It is very effective to relieve headaches, tension, TMJ problems, and low back or pelvic pain. For infants, it is very good for relieving colic and improving sleep. 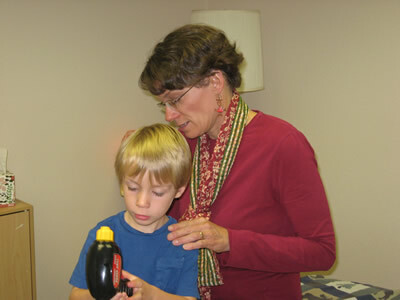 Children with disabilities show improvements in their skills and behavior with craniosacral therapy. Neurovascular Integration, or Neurovascular Therapy, was developed by Cathy Pliscof Holway, PT, DPT, as she sought a gentle, respectful way to honor the self-healing mechanisms of body, mind and spirit. She developed a way to palpate the tissues of the body and encourage the flow of critical fluids through restricted areas, and reconnect the autonomic nervous system in a more balanced way. Neurovascular Integration uses the gentle touch of Profound Neutral to assess the integrity of the nervous system and the fluids and structures that it illuminates. Restoring balanced function to our sensory processing circuits helps the brain regulate internal and external experiences of the body. This allows us to release inappropriate pain signals and remember joyful motion and function throughout the body. Enhancing nervous system flow results in a greater ability for self-correction, which is an important, inherent function in all of us. Many chronic pain conditions lead to confusion in the brain’s pain processing areas, leading to inappropriate signaling of pain that is not really occurring in the body. Providing alternative input to the nervous system helps to clear those aberrant circuits and restore balanced assessment of sensory information. “Pain” is no longer the neural response to every stimulation we encounter. Children with developmental delays or sensory processing disorders also tend to have disorganized wiring through the brain’s critical processing centers. The gentle touch of Profound Neutral, combined with guidance in appropriate neurodevelopmental movements and activities, works with the inherent plasticity of the brain to reorganize the wiring and introduce normal function. For more information, please go to www.nvinstitute.com.